It is one of the simple Intraday Trading system. which requires just few minutes of your time every day. 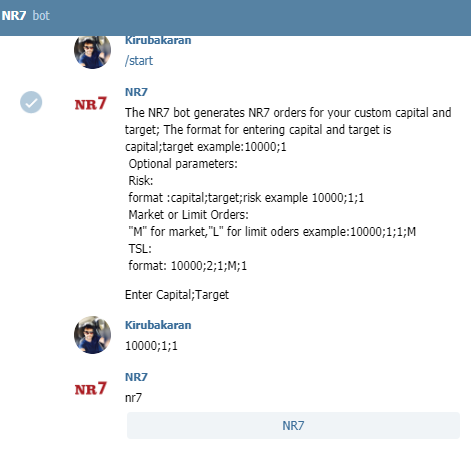 Let me explain what is NR7 trading strategy and how one can use this BOT to automate the trades. Market goes through regular contraction (i.e. daily trading range getting shorter and shorter) and expansion (i.e. daily trading range getting bigger) cycle. Expanding range is followed by Contraction and vice-versa. So if we can identify the narrow range days, then it give us a step ahead of everybody to benefit from coming expansion. NR7 is term given to a day that has the daily range smallest of last 7 days including that day. 4) If today’s range is smallest of all 7 days, then today is NR7 day..else not. This is one of my favorite setup. It gives u a chance to be ahead of trend follower / indicator followers who will jump in the trend after you. One of the easiest way to trade this setup will be to go long above the Day’s high of NR7 day with stop at the Day’s Low of NR7 day. Go short below the Day’s Low of NR7 day with stop at the Day’s High of NR7 day. As per this strategy, you get the exact levels of Buy and Sell. We share this info regularly in our telegram channel daily for the benefit of new traders. Now we have an automated Trading bot for you, which will automatically scan the list all stocks and find the one that are NR7 stocks. 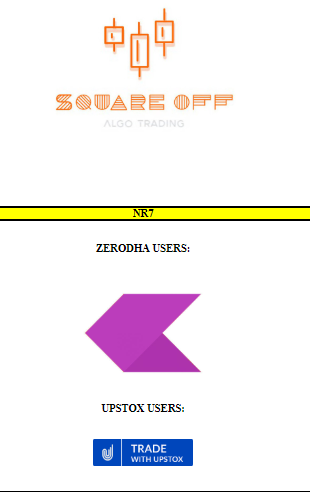 All you have to do is, go to NR7 BOT @NR7_squareoff_bot in Telegram app and enter your input. It is very similar to the ORB Trading bot. 10000;10;1;M;1 denotes 10000 capital with 10% target, 1% risk per trade, order type is stop loss market order and 1% Trailing Stop loss. 10000;10;1;L;1 denotes 10000 capital with 10% target, 1% risk per trade, order type is stop loss LIMIT order and 1% Trailing Stop loss. So here, buy price will be 100 with stop loss at 95, hence in stop loss value, the bot will enter 5, as you have given 1% as your risk per trade, when the stop loss is hit, you lose 5(stop loss)* 20(quantity) = Rs.100 which is 1% of your capital Rs.10000. 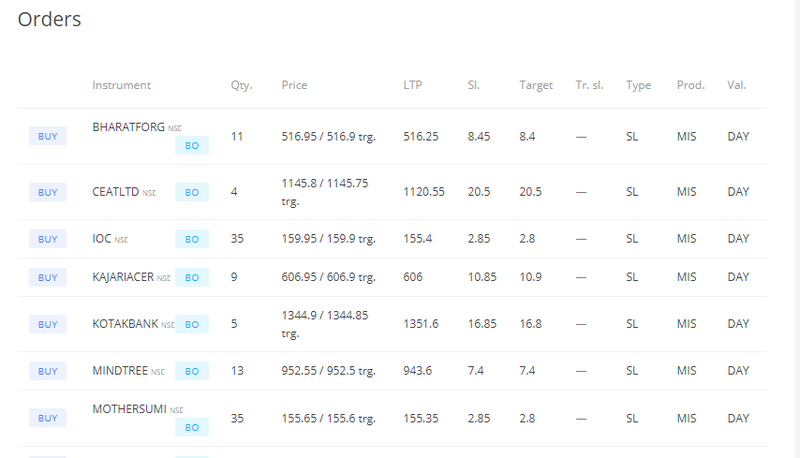 You have given target as 10%, so when Buy order at Rs.100 executed, automatically the bot will enter target value as 50, so when price moves from Rs.100 to Rs.150, you make 50(target) * 20 (quantity) = Rs.1000 which is 10% of your capital Rs.10000. Lets say you’ve purchased a stock at 100, as per orb the stop loss as 5 i.e if the stock falls to 95 your potions will be closed, and BOT entered the TSL as 5, which is 1% of your capital. Now lets say the stock moves from 100 to 105 since BOT put a TSL, you’re stop loss will move from 95 to 100. Basically, if the price moves in your direction(profit), your stop loss will also move by the same number of points BOT has mentioned in the Trailing stop loss column. Just click on Place, it will place the order for you. Whenever your given target or stop loss is hit, it will automatically close the orders, if there are any open orders at 3:20 pm, close it manually to avoid penalty charges from the broker. New users who wish to subscribe to this bot can use the below link.